We’d love your help. Let us know what’s wrong with this preview of A Compendium of the Mahayana by Tsadra Foundation. The first complete English translation of Asanga's Mahayanasamgraha, the most important and comprehensive Indian Yogacara text, and all its available Indian commentaries. 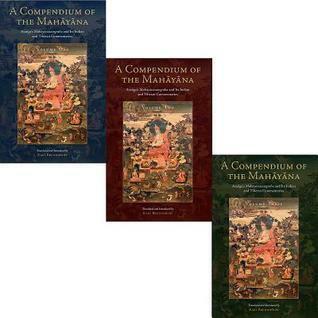 The Mahāyānasaṃgraha, published here with its Indian and Tibetan commentaries in three volumes, presents virtually everything anybody might want to know about the Yogācāra School of mahāyāna Buddhism. It d The first complete English translation of Asanga's Mahayanasamgraha, the most important and comprehensive Indian Yogacara text, and all its available Indian commentaries. The Mahāyānasaṃgraha, published here with its Indian and Tibetan commentaries in three volumes, presents virtually everything anybody might want to know about the Yogācāra School of mahāyāna Buddhism. It discusses in detail the nature and operation of the eight kinds of consciousness, the often-misunderstood notion of "mind only" (cittamātra), dependent origination, the cultivation of the path and its fruition in terms of the four wisdoms, and the three bodies (kāyas) of a buddha. Volume 1 presents the translation of the Mahāyānasaṃgraha along with a commentary by Vasubandhu. The introduction gives an overview of the text and its Indian and Tibetan commentaries, and explains in detail two crucial elements of the Yogācāra view: the ālaya-consciousness and the afflicted mind (kliṣṭamanas). Volume 2 presents translations of the commentary by Asvabhāva and an anonymous Indian commentary on the first chapter of the text. These translations are supplemented in the endnotes by excerpts from Tibetan commentaries and related passages in other Indian and Chinese Yogācāra works. To ask other readers questions about A Compendium of the Mahayana, please sign up.